weeWONDERBOX is a series of face-to-face events. It‘s a collaboration between the Iona Community’s Programme team and the Wild Goose Resource Group. 2016-17 was our first, highly successful full year of programmed events, most taking place in The Ground, the event space of the Iona Community’s new base at 21 Carlton Court, in Glasgow. A highlight of the year was the first ColumbaFest in June which was a weekend festival of events and concerts. 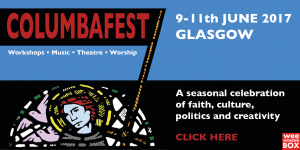 The second ColumbaFest will take place on the weekend of 8th-10th June 2018. Fri 10th @ 2.00-4.00pm Lent Ten – an urban retreat. CANCELLED.